I got a little done on my Rainbow Scrap Challenge 2012 this week. 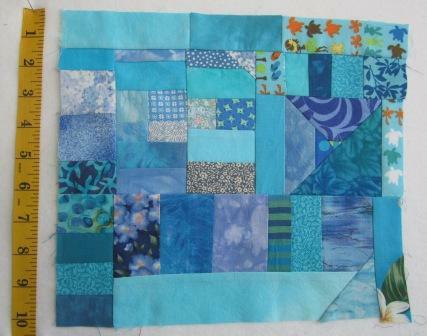 I started with two blue 12" squares, maybe not what some would call scrap but they were not yardage size. I would cut and cut a double line through both squares then sew then together with the opposite fine line inserted. They are a little less than 10" now but I like them. Not sure what I will do with them. To see what the others have been doing for the RBSC 2012 go see the links at Socrappy. 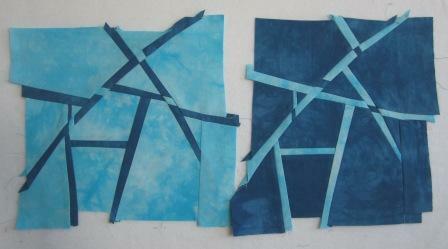 I also got some poverty piecing done with my light blues and turquoise scraps. You can see some of the pieces were very small. I made this one with a better straight edge then some of the others. 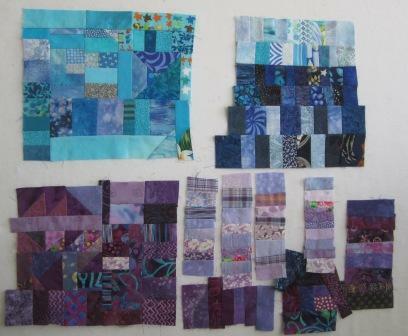 Here are some of the other Poverty Piecing I have done the last couple of months. I really do not have a plan for these. Not sure what will come of them. It is a bit like free fabric because they are some of the smallest bits and what else would you do with it. To see more on what I have been working on for the RBSC 2012 over the months check out Scrap Saturday. There is a freedom in poverty piecing. You can do anything with free fabric and feel good about it. I like the experimental blocks as well -- quite striking. The 12" square piecing technique looks interesting. I like idea of swapping the colors. Another idea to add to the "to do" list! Very unique blocks, I have never heard of poverty piecing,looks like tiny, tiny scraps. Would they be large enough to make into a small bag? I really like the fractured look of your new blocks. I am interested to see how you use them. Beautiful work Kathy! I keep saying I'm going to try one! Your Poverty Piecing is wonderful too!